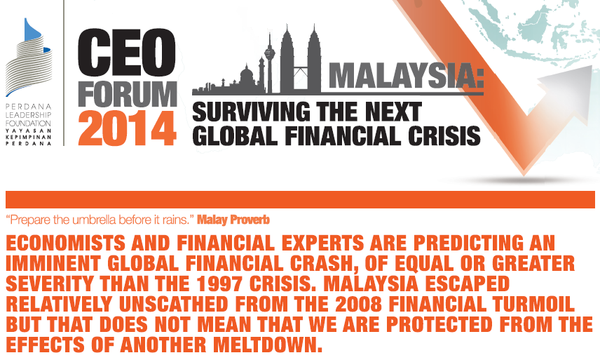 [Perdana Leadership Foundation CEO Forum 2014: Malaysia: Surviving the Next Global Financial Crisis] Economists and financial experts are predicting an imminent global financial crash, of equal or greater severity than the 1997 crisis. Malaysia escaped relatively unscathed from the 2008 financial turmoil but that does not mean that we are protected from the effects of another meltdown. The warning signs of another crash are present: speculative, bubble-inducing money inflows into emerging markets, including Malaysia, as a result of US quantitative easing policies; rising property prices due to low interest rates; record high household debt and public debt to GDP ratios; and a persistent budget deficit due to various government economic stimulus packages. These elements are also in play in other South East Asian countries as well as in China, India and Brazil, increasing the likelihood of a global financial contagion. Is Malaysia strong enough to withstand another major economic collapse? What steps can we take now to strengthen our economy against the onslaught of a crash?